If your home or business requires water damage restoration due to a basement flood, damaged plumbing or appliances, or flooding as a result of fire suppression, time is absolutely of the essence. The effects of a basement flood or other water damage can go quickly from bad to irreparable. Excess water can promote electrical hazards, cause expensive damage to your property structure and furnishings, and can even lead to the growth of hazardous mold. That's why ServiceMaster Restore of Sudbury is on call 24/7 to provide you with a reliable lifeline when water damage restoration is needed. 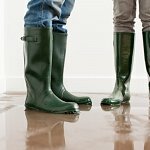 You can count on us to provide professional water damage and flood restoration using the industry's best products and techniques. Water damage is a significant danger to both homes and businesses. Quick mitigation prevents water damage from spreading, lowers costs and means less stress for you. Waiting to begin water and flood restoration services can cause secondary damage to the structure, carpets, furnishings, and lead to mold contamination. Extreme water damage to hardwood floors can require replacement, and contribute to elevated odours from absorbed water, not to mention costs. At ServiceMaster Restore of Sudbury, our certified technicians use advanced technology and equipment for our water damage restoration services. This technology removes moisture and promotes effective drying. Drying time can be dependent on the location, duration and source of water damage, building materials and weather. If your home or business has been damaged by water, you want professional water damage restoration services. A thorough examination by our certified technicians, with the use of specialized equipment such as moisture-detection meters, probes and sensors help to determine the extent of the water damage. This enables us to form the most effective water remediation and restoration plan for returning your property back to normal as quickly as possible and restoring your peace of mind. Our team of certified water damage restoration professionals has the expertise and know-how to navigate from crisis to resolution. Shoulder to shoulder, our team works in a clear, decisive and results-oriented manner from assessment and mitigation of the water damage through to restoration. We are ready to respond to your water damage needs, day or night. Call ServiceMaster Restore of Sudbury today!